The June 23 U.K. vote to leave the European Union shook the financial world: the pound plunged to a more than 30-year low versus the dollar, investor confidence collapsed and talk turned to London losing its place as Europe’s financial capital. 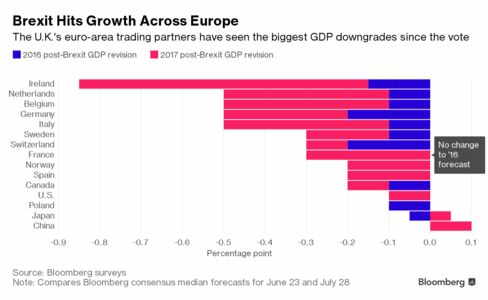 Economists expect U.K. economic growth to take a 2 percent combined loss in 2016 and 2017, and those with close ties to the U.K. won’t fare much better. Growth will be hit for virtually all of Britain’s most important trading partners over the next few years, according to Bloomberg’s economic surveys. 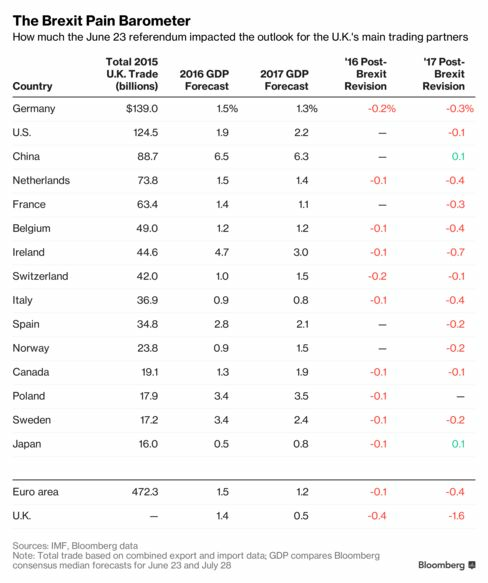 The worst affected will be across-the-pond in Ireland, which has seen a combined 0.9 percentage point shaved off its 2016 and 2017 Bloomberg consensus GDP forecasts in the five weeks since the Brexit vote. The euro area, which shares $472 billion in trade with the U.K., has seen its growth forecast for the next two years fall by 0.5 percentage point since June 23. The U.K.’s largest single-country trading partner, Germany, is expected to grow 1.5 percent this year and 1.3 percent next year, down a combined 0.5 percentage point since the Brexit vote. Other EU country forecasts have been similarly revised down as concern mounts that more referendums about EU membership could spur another euro area crisis. “We believe this risk is very real, ” Barclays strategists, including Ajay Rajadhyaksha, wrote in a note this month to clients. “Anxiety over immigration and a weak economic recovery appear to have significantly eroded pro-EU sentiment in the euro area.”Economists have cited various reasons for downgrading growth forecasts for countries with close links to the U.K., including expectations of decreased trade with EU countries, the risk of anti-EU contagion to other member nations, and the effect of general uncertainty about how the negotiations to leave will play out. The International Monetary Fund this month cited Brexit as a factor for lowering its global growth forecast, saying the effects will be concentrated in advanced European economies with minimal impact on other nations, including the U.S.
Asian countries may only see a minimal Brexit effect on their growth forecasts. Japan’s 2016 growth forecast was cut by just 0.1 percentage point since the vote and it, along with China, Britain’s third-biggest trading partner, has actually seen a boost to its outlook for next year. China may ultimately overcome any headwinds through its own strong economic performance, according to Barclays. The London-based bank lowered its 2017 forecast for China to 5.5 percent from 5.8 percent following the Brexit vote, only to increase it again to 5.7 percent July 15 after the country reported strong second-quarter growth.